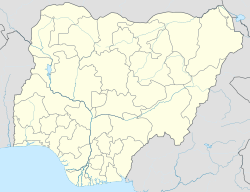 Ikom is a Local Government Area of Cross River State, Nigeria. Its headquarters are in the town of Ikom in the east of the area on the Cross River and the A4 highway at5°57′40″N 8°42′39″E﻿ / ﻿5.96111°N 8.71083°E﻿ / 5.96111; 8.71083. It has an area of 1,961 km² and a population of 162,383 at the 2006 census. The people of Ikom are majorly farmers. Ikom is a major producer of Banana and Plantain for the Nigerian market. Ikom is known for the Ikom monoliths, artifacts that bear an ancient writing sometimes taken to be an early form of nsibidi. This page was last edited on 27 March 2018, at 14:30 (UTC).